The Server configuration option called Agent XPs is used to enabled the SQL Server Agent extended stored procedures on the server. When this option is disabled, the SQL Server Agent node is not enabled in SQL Server Management Studio and you can not use the SQL Server Agent Service. 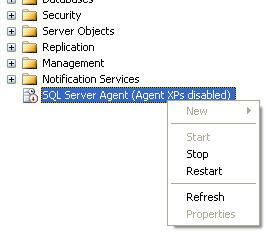 When the SQL Server agent is restarted, the extended stored procedures are enabled automatically.